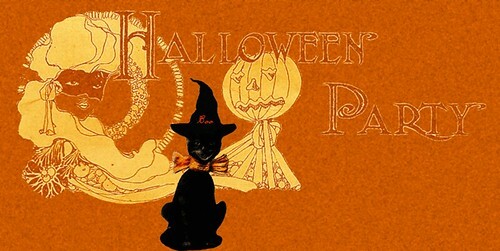 The Graphic Addict: Vintage Halloween Fun! Free vintage images! Vintage Halloween Fun! Free vintage images! You all know by know I Love vintage Christmas! I am ready to blast you with all kinds of vintage Christmas images but I am holding myself back! No one likes to walk into a store in September to be pounded with Christmas items, right? Ooooo how I hate that panicky feeling like I forgot Christmas.. was in THREE months!! (Well, two and a half but I need to exaggerate to make my point) Anyhoo (only blog that word-don't know why) I am playing with some more time appropriate images. Here is a cute little Boo Kitty I worked up today just for you!! I hope you like him. Great kitty kat! Yes, I'm blogging without obligation and it's wonderful! I'm telling everyone to do it. Sort of frees you up to actually go ahead and post something, doesn't it? (Like a pie..... so artistic heh heh) Thanks for visiting me. I have very few and I always get a kick out of seeing that you stopped by! PS: What a "brush"? I have no clue.